Received August 6, 2018; Revised September 4, 2018; Accepted September 4, 2018. Sesame (Sesamum indicum L.) is an important oilseed crop grown in tropical and subtropical areas. The objective of this study was to investigate the genetic relationships among 129 sesame landraces and cultivars using simple sequence repeat (SSR) markers. Out of 70 SSRs, 23 were found to be informative and produced 157 alleles. The number of alleles per locus ranged from 3 – 14, whereas polymorphic information content ranged from 0.33 – 0.86. A distance-based phylogenetic analysis revealed two major and six minor clusters. The population structure analysis using a Bayesian model-based program in STRUCTURE 2.3.4 divided 129 sesame accessions into three major populations (K = 3). Based on pairwise comparison estimates, Pop1 was observed to be genetically close to Pop2 with FST value of 0.15, while Pop2 and Pop3 were genetically closest with FST value of 0.08. Analysis of molecular variance revealed a high percentage of variability among individuals within populations (85.84%) than among the populations (14.16%). Similarly, a high variance was observed among the individuals within the country of origins (90.45%) than between the countries of origins. The grouping of genotypes in clusters was not related to their geographic origin indicating considerable gene flow among sesame genotypes across the selected geographic regions. The SSR markers used in the present study were able to distinguish closely linked sesame genotypes, thereby showing their usefulness in assessing the potentially important source of genetic variation. These markers can be used for future sesame varietal classification, conservation, and other breeding purposes. Sesame (Sesamum indicum [L.] 2n = 2× = 26; 357 Mb), which belongs to the Sesamum genus of the Pedaliaceae family, has been cultivated for centuries in more than fifty countries (Bhat et al. 1999; Wang et al. 2014a), particularly in Asia and Africa. Sesame seeds are highly valued for their oil which is exceptionally resistant to rancidity (Anilakumar et al. 2010). Sesame oil has been widely used in Asian and Far Eastern oriental medicines due to its high lignan and sesamin components, and as a remedy for toothaches, gum diseases, healing treatment of blurred vision, dizziness, and headache (Hirata et al. 1996). The sesame consumption has been found to reduce muscle damage, systemic inflammation, and oxidative stress and improve aerobic capacity and performance of athletes (Barbosa et al. 2017). The lignan content of sesame seeds has been reported to enhance the biological activity of tocopherol in the tissues by inhibiting its metabolism in rats (Uchida et al. 2007). Compounds like sesamin and sesamolin have a cholesterol-lowering effect in humans (Anilakumar et al. 2010). Besides, sesame is also rich in phosphorus, iron, magnesium, manganese, zinc, and vitamins such as E, B1, and A (Hanzawa et al. 2013; Barbosa et al. 2017). All these properties show the nutritional significance and medicinal importance of sesame seeds making it a highly valued crop. Since 1955, sesame breeders in Korea have developed improved cultivars by integrating pure-line selection, cross-breeding, and mutation induction breeding methods (Kim et al. 2002; Kang et al. 2006). The varieties in early 1970 to 2000 were mostly developed by crossing two or more elite lines, which may have led to the narrow genetic base in present sesame cultivars, as evidenced by several genetic diversity studies performed using Korean sesame germplasm (Kim et al. 2001; Kim et al. 2002; Min et al. 2016). As a result, it is essential to perform genetic diversity and population structure analyses of Korean sesame germplasm in order to increase its genetic base through intercrossing among the varieties. Considering the unorganized linkage groups and the incomplete and indecent genome sequence of sesame in the past years, there is now a breakthrough progress in sesame genome sequence allowing us to survey and extract markers for diversity and genetics studies (Zhang et al. 2013; Wang et al. 2014a, b; Wang et al. 2017). With the recent successful development of de novo sequencing (Wang et al. 2014b; Wei et al. 2014), the universal marker panel for DNA fingerprinting of sesame accessions is underway to investigate concurrent indication and precise interpretation of ancestral genetic backgrounds (Dossa et al. 2017). The genome size of sesame surveyed is 357 Mb (Wang et al. 2014a), which is smaller than maize and soybean, yet there is a prerequisite in finding high-density DNA markers with high reproducibility and discriminatory power covering the whole genome. Simple sequence repeats (SSR) markers are highly polymorphic, reproducible, codominant, and multi-allelic, which makes them suitable for a wide range of applications. Moreover, they have low running cost and are amenable to automation (Rao and Hodgkin 2002; Kalia et al. 2011). In sesame, many researchers have developed and used SSR markers for genetic diversity and population structure analyses (Dixit et al. 2005; Wei et al. 2014; Uncu et al. 2015). Such studies involving Korean sesame germplasm indicated narrow genetic base in present sesame cultivars. Therefore, it is imperative to find means to promote introgression between germplasm lines and improved varieties from diverse geographical locations, which may help to expand the narrow gene pool of Korean sesame varieties. Hence, understanding the genetic diversity and population structure of available germplasm is highly essential. In this study, informative SSR markers were used to investigate molecular variance and population structure of 129 sesame cultivars and landraces collected from diverse countries worldwide, predominantly from Korea. Moreover, AMOVA was employed to analyze molecular variance and population structure of the selected set of sesame germplasm. A set of 129 genotypes (n = 129, Table 1) of sesame cultivars and landraces from Korea and different parts of the world obtained from the Gene Bank of Rural Development Administration (RDA), Jeonju, Korea were used in this study. The set included 91 Korean genotypes, with 11 commercial cultivars and 6 elite lines. The remaining 38 germplasm accessions were collected from different origins across the world: 5 from USA, 4 each from India, Afghanistan and Japan, 3 each from China, Israel, and Mexico, 2 from Iran, and 1 each from Jordan, Libya, Myanmar, Nepal, Russia, Serbia, Sri Lanka, Turkey, Taiwan, and Venezuela (Table 1). Apical young leaves of 15 – 20 days old sesame plants were collected and used for DNA extraction. The leaves were grounded in liquid nitrogen to make a fine powder and used to extract DNA according to the manual for DNA isolation from plant tissue using DNeasy™ Plant Maxi kit (QIAGEN GmbH; Hilden, Germany). The DNA was then quantified with Nanodrop Lite (Thermo Scientific, USA). A set of 70 primer pairs confining di-, tri-, and oligonucleotide sequence repeat motifs were selected from 109,528 SSR markers with known physical position on the sesame linkage groups (LG) (PMDBase database) referring to the first de novo draft (Wei et al. 2014) of sesame genome (http://www.sesame-bioinfo.org/PMDBase/). The lengths of nucleotides of the primer sequences ranged from 18 to 27. The primers were synthesized with Bioneer (Seoul, Korea) (Supplementary Table S1) and used in the study. DNA amplification was carried out in a 25 μL reaction mixture containing 50 ng of genomic DNA, 1X reaction buffer (25mM MgCl2 included), 100 μM of each dNTPs, 5 pmol/μL forward and reverse primer, and 0.5 U of e-Taq DNA polymerase. All the chemicals used were purchased from SolGent Co., Ltd., Korea. The PCR was performed in a DNA thermocycler (Mastercycler Nexus GSX 1 Eppendorf, Germany) following this program: initial denaturation at 95°C for 5 minutes, followed by 35 cycles of 20 seconds at 95°C, 40 seconds at 44 to 56°C depending on the annealing temperature of the primer, and 30 seconds at 72°C, with a final extension at 72°C for 7 minutes. The amplification success and polymorphisms of the selected primer pairs were initially investigated in eight genotypes (‘Milseong’, ‘Ansan’, ‘Galmi’, ‘Kangheuk’, ‘Daheuk’, ‘Kopoom’, ‘Chamhwang’ and ‘Yangbaek’). The polymorphic primer pairs were then used to genotype the remaining 121 accessions. The amplification patterns of the PCR products were checked on 1.5% agarose gel visualized by ultraviolet illumination after staining with ethidium bromide. For the detection of the amplicons, capillary gel electrophoresis on an ABI 3130XL Genetic DNA Analyzer was used (Applied Biosystems, Carlsbad, CA, USA). Size of the amplified products was calculated based on an internal standard (500ROXTM Size Standard, Applied Biosystems) using GeneMarker® Software version 1.85 (Soft Genetics, State College, PA, USA). Phylogenetic analysis was conducted using Jaccard’s similarity coefficient through NTSYS-pc software Version 2.11 (Rohlf 2001). The similarity matrix was used in cluster analysis using the unweighted pair-group method with arithmetic averages (UPGMA) and sequential, agglomerative, hierarchical and nested (SAHN) clustering algorithm to obtain dendrogram. The Nei’s (1973) genetic diversity (h), Shannon index (I*) (Lewontin 1972) were calculated with POPGENE Ver. 1.32 (Yeh et al. 1999). The polymorphic information content (PIC) was used to determine the usefulness of each marker. Additional genetic diversity parameters included major allele frequency (MAF), average number of alleles (NA), observed heterozygosity (Ho), and gene diversity (expected heterozygosity; He). These were calculated using the PowerMarker version 3.25 (Liu and Muse 2005). The population structure was investigated using a Bayesian clustering method implemented in the software STRUCTURE 2.3.4 (Pritchard et al. 2000). The STRUCTURE input file for the 129 accessions was generated using PGDSpider software ver. 2.1.1.3 (Lischer and Excoffier 2012). The optimum K 10 runs (set to K = 1 to K = 10) or ancestral genetic clusters was determined from replicate runs for each value of K with the length of burn-in period set to 500,000 and the Markov chain Monte Carlo (MCMC) repeats to 500,000 run length. A model allowing for admixture model where both correlated and independent allele frequencies were tested. The output of the 5 runs was used to estimate the most likely number of gene pools (K) according to the method described by Evanno et al. (2005) using ad hoc Delta K (ΔK) statistic. Within a group, genotypes with inferred ancestry based on probability values ≥ 60% were assigned to a different group, and those with ≤ 60% were treated as “admixture”, i.e., these genotypes seem to have a mixed ancestry from parents belonging to different geographical origins or gene pools (Uncu et al. 2015). The Analysis of Molecular Variance (AMOVA) was performed to examine molecular variance within and between the populations (cluster) and correlation of alleles of pairwise estimates between populations, FST, was calculated using Arlequin ver. 3.5.2 (Excoffier et al. 2005). The names, sources and germplasm collection site codes of 129 sesame genotypes from the 19 countries were used in the present study (Table 1). Twenty-three SSRs found to be polymorphic with clear and informative amplicon profiles were selected to analyze genetic diversity among sesame genotypes (Table 2). The fragment size, their annealing temperatures, and SSR loci diversity statistics are given in Table 2. The NA ranged from 3 to 14 with an average of 6.9 alleles. PIC and He (expected heterozygosity) values ranged from a low of 0.33 and 0.38 to a high of 0.86 and 0.88 with an average of 0.65 and 0.72, respectively. The MAF ranged from 0.18 to 0.78, with an average of 0.41. Shannon’s information index (I*) and Nei’s gene diversity (h*) ranged from a low of 0.09 and 0.04 to a high of 0.69 and 0.50 with an average of 0.55 and 0.38, respectively. MAF, PIC, He, NA, Shannon’s index (I*) and Nei’s gene diversity (h*) per locus had wide ranges among the markers (Table 2). The phylogenetic analysis using NTSYSpc 2.11 software grouped 129 sesame genotypes into eight clusters (Cluster I to Cluster VIII). The cluster I and II contained a maximum number of genotypes 64 and 39, respectively. The clusters III, IV, V, VI, VII, and VIII consisted of 5, 7, 4, 3, 2 and 5 genotypes, respectively (Fig. 1). Majority of the germplasm from Korea grouped into Cluster I and II (Fig. 1). To reveal the extent of genetic relatedness among the 129 sesame genotypes, genetic similarity values (shown under bar lines in Fig. 1) were obtained with NTSYSpc 2.11 software and used to generate a dendrogram. The genetic similarity coefficients among the genotypes ranged from 0.16 to 1.00. The highest genetic similarity coefficient (100%) was detected between germplasm landraces IT184433-AFG1 and PI164491-IND3, and between PI156618-CHN2, PI157156-IND2 and Gomazou-JPN1. A critical look at the pedigree of some of the cultivars in the Cluster I showed that the cultivars which shared common parents were found to cluster together with high similarity coefficients. For instance, the cultivar Anbaek-KOR57 and Kyeonbuk27-KOR83, which share ‘Suwon178’ as one of the parents (Table 1), were found to cluster together (Fig. 1). Similarly, Yubaek-KOR32 clustered with Goenbaek-KOR39 and Dodam-KOR41 with similarity coefficients of 0.81 and 0.87, respectively. The Korean cultivar ‘Yubaek’ was developed from a cross of ‘Yangbaek and Sungbun, which are the donor parents for ‘Dodam’ and Goenbaek’, respectively. Likewise, Danbaek-KOR3 and Heuksun-KOR20, which is developed from a combination cross of ‘Renner/Danbaek × Hanseom/Yusung’, were found to cluster together. In addition to the clustering of cultivars from Korea, we also observed a clustering of Poongan-KOR49 with a Japanese landrace NoggiS-4-JPN4 at 0.81 similarity coefficient value. The Korean cultivar ‘Poongan’ is derived from a cross of ‘NoggiS-2’, a landrace from Japan crossed with ‘HS53-3-11’, and ‘Hanseom’, a cultivated type breeding line. In the same way, cultivars Poongsan-KOR11, Pyoungan-KOR28, and landrace IT193692-KOR91 clustered together. ‘Poongsan’ and ‘Pyoungan’ both have a mutant pedigree background selected from mutant lines ‘dt-45’ and ‘Ansan’, as well as elite gene pools such as ‘Suwon9’ (‘Hanseom’) and ‘Suwon136’ and landrace germplasm lines ‘S7448’ and ‘PI195123’. In the Cluster II, Soonheuk-KOR18 was found to cluster with Nambaek-KOR21 at similarity value of 0.85. This may be due to substantial cross of elite lines (Suwon5, Suwon9, Suwon11, and germplasm line PI195123) in their parents, ‘Poongnyun’, ‘Danbaek’ and ‘Jinju’. Likewise, ‘Hanseom-KOR6’, a sister line of cultivar Danbaek-KOR3 (from Cluster I), clustered with Seodun-KOR14 (developed from a mutational induction breeding of ‘Danbaek’) at a similarity coefficient of 0.68. In Cluster III, five genotypes namely, Sunbaek-KOR22, Baengmi-KOR81, Jungmo5006-KOR67, IT30249-RUS1, and Miho-KOR63 clustered together. Of these, ‘Miho’ and ‘Jungmo5006’ shared ‘Iksan22’ elite line as a common parent. Clusters VI, VII, and VIII had the most diverse (from different origins) genotypes grouped at the lowest range of genetic similarity (0.28 to 0.35). Cluster VI consisted of genotype PI158931-CHN1 (0.33), and cultivars Kangheuk-KOR24 and Hwangbaek-KOR45 (at 0.55). In the Cluster VII, two genotypes, PI164317-IND4 and Annam-KOR43, clustered together at a similarity value of 0.35. In the Cluster VIII, Hwaheuk-KOR15 grouped with Namda-KOR19 at 0.50 similarity value, while Baeksul-KOR60 grouped with Kyeonbuk33-KOR89 and Arum-KOR56 at similarity values of 0.55 and 0.35, respectively. The model-based clustering was performed using 129 genotypes and 23 SSR markers. As per method suggested by Evanno et al. (2005), the population was surveyed based on the ad hoc ΔK statistic. The sesame germplasm lines used in this study were divided into three “K = 3” or seven “K = 7” major subgroups (Fig. 2a). The best population genetic structure model was likely to be at “K = 3” displaying the clear highest value of ΔK (277.8). For K = 7, a fairly higher value of ΔK (144.0) was obtained, as displayed in Fig. 2a. This suggested the presence of three major subgroups (populations) and 35 genotypes as an admixture (Table 1). The STRUCTURE analysis grouped sesame genotypes into three populations namely, Pop1, Pop2, and Pop3 (Fig. 2a). Moreover, most accessions were divided into three subgroups Pop1 (41), Pop2 (32), and Pop3 (21), and 35 for admixed sesame genotypes. Pop1 consisted of 41 accessions, originating from 10 countries – most from Korea (25); followed by 3 genotypes each from the USA and Afghanistan, 2 each from Israel, Japan, Mexico, and 1 each from India, Venezuela, China, and Turkey. Pop2 consisted of 32 accessions comprising 26 genotypes from Korea, 1 each from the USA, Jordan, Israel, Taiwan, Iran, and Serbia. Pop3 included 21 accessions comprising 15 genotypes from Korea, 1 each from India, Iran, Japan, Libya, Myanmar, and Russia. The admixture group consisted of 25 genotypes from Korea, 2 each from China and India, 1 each from Afghanistan, Japan, the USA, Mexico, Sri Lanka and Nepal (Fig. 2b, Table 1). It has been reported that subdivision into K = 2, K = 14, and K = 22 population structure on model-based cluster had appeared admixed; however, even in K = 22, there was no obvious relationship between geographic origin and genetic diversity of germplasm accessions (Okello-Anyanga et al. 2017). However, the subpopulations showed in STRUCTURE analysis were not very clear. To get further insight into the genetic pool relations of these clusters, an UPGMA tree dendrogram was built from the matrix of similarity according to the coefficient of Jaccard. A nearly perfect match between the STRUCTURE population cluster subgroups (Pop1 and Pop2) and the UGPMA cluster subgroups (Cluster I and II) was observed (Table 1, Figs. 1 and 2); however, Pop3 was dispersed onto UPGMA Clusters III, IV, V, VI, VII, and VIII. Pair-wise estimates of FST indicated a high degree of differentiation varying from 0.15 between Pop2 and Pop1 to 0.21 between Pop3 and Pop1, whereas low FST estimates were observed between Pop2 and Pop3 with a value of 0.08 (Table 3). Thus, the molecular genetic diversity was highest in between Pop1 and Pop3. Based on criteria used by Cui et al. (2017), the pair-wise F statistics at FST = 0 implies no differentiation between the populations, whereas FST = 1 implies complete differentiation between the tested populations. Likewise, little, moderate and strong differentiation can be evaluated at FST = 0.05, 0.05 ≤ FST ≤ 0.15, and 0.15 ≤ FST ≤ 0.25, respectively. Based on the above-mentioned criteria, there was moderate molecular variance between populations given by the STRUCTURE model. AMOVA indicated strong differentiation between Pop1 and Pop3 (0.21), medium differentiation between Pop1 and Pop2 (0.15), and very little differentiation interpreted between Pop2 and Pop3 (0.08) (Table 3). For the model-based population structure Pop1, Pop2, and Pop3, AMOVA analysis indicated that 14.16% of the total genetic variation was divided among populations, and 85.84% within populations, suggesting that there was adequate variability for future sesame breeding programs (Table 4). Even for K = 7, the second highest value indicated by ΔK (144.0) (Fig. 2a), the AMOVA revealed that there was 19.72% molecular variance among populations and 80.28% within populations (data not shown). The distribution of molecular genetic variation among and within origin-based subgroups (n = 19) by AMOVA revealed that 9.55% was among the origins (representing respective countries) and 90.45% was among individuals within origins of respective countries. The level of molecular variation was statistically significant but comparatively low when AMOVA was conducted among the countries of origin (Table 4). The overall FST values for model-based and country-based origins were 0.1416 and 0.0955 indicating a moderate differentiation among country of origins and the three populations (Table 4). Sesame is one of the important oil crops and has a wide range of food, nutraceutical, and pharmaceutical applications. The various bottlenecks during selection and domestication of sesame reduced the genetic base of present-day cultivars. Hence, understanding the genetic relatedness of sesame cultivars and landraces is crucial for widening their genetic base, and for the trait improvement. In this study, genetic diversity and population structure analysis of 129 sesame germplasm collected from various countries (Table 1) was performed using SSR markers. The PIC level obtained in this study (0.65) was highly comparable to some of the previous genetic diversity analyses in sesame (Wei et al. 2014; Dossa et al. 2016). Compared to another type of repeat motifs, dinucleotide repeat motifs GA and TA were found to be highly informative and provided a consistent expression that can be easily detected and analyzed (Supplementary Table S1). This indicated that SSRs containing GA or TA repeat motifs might be preferred over other dinucleotide repeat motifs in marker-based analyses in sesame. Cluster analyses of 129 genotypes showed a high degree of mixed distribution patterns in the topology of their respective dendrograms. All the commercial cultivars and exotic germplasm lines were dispersed throughout the UPGMA cluster, at close genetic similarity with each other and/or with the Korean cultivars. These results suggested the occurrence of intense interbreeding activity between Korean and exotic germplasm lines in the past few decades. Moreover, an existing source of genotypes hybridized between exotic, mutated, landrace crosses shared similar gene pools. It further indicated that the elite lines were exploited more frequently than the other landraces or cultivars in the last few years. As a consequence, excessive usage of limited elite lines may have led to the relatively narrowed genetic background of sesame. Alternatively, the decreased genetic diversity in cultivated sesame cultivars could be due to the strong genetic drift resulting in a rapid decline of population size, or sampling error during individual selection. The human factor can also be a reason for the lack of correlation between genetic and geographical distance since farmers and breeders make a great contribution in developing new hybrids causing gene flow and migration events between landrace and cultivar crossing practices. It could also be due to various breeding approaches such as cross-breeding and mutational-induction (Kim et al. 2002; Kang et al. 2006), which leads to hybridizing the genetic backgrounds. Ercan et al. (2004) reported that even geographically and morphologically distinct accessions could be clustered together in the same cluster. Previous cluster analyses using molecular markers often showed contradictory results, displaying from persuasive (Ali et al. 2007; Dossa et al. 2016; Cui et al. 2017) to complex accession distribution patterns (Cho et al. 2011; Uncu et al. 2015; Okello-Anyanga et al. 2017) based on their geographical origin. The degree of genetic variation is relatively low in sesame compared with other crops (Bhat et al. 1999; Ali et al. 2007; Zhang et al. 2012). Mondal et al. (2015) observed an excess of alleles due to population expansion or genetic drift in both improved cultivars versus landraces, and landrace versus introgression germplasm lines. It also suggested for a reduction in genetic diversity during domestication of improved cultivars compared to landraces. However, phenotypic performances of these exotic landraces and cultivars remain to be assessed in future studies, in addition to the selection of superior genotypes that show significant variation to abiotic and biotic stress factors for hybridization programs (Rao et al. 2013). Wei et al. (2016) identified positively selected genes between landrace and variety which they concluded based on systematical analysis associated with desired agronomic traits such as flowering, height, and oil content. The genes involved in useful agronomic traits such as lipid metabolism, flowering-related and more significantly, disease resistance genes (Wang et al. 2014b) undergone domestication and artificial selections of sesame breeding. In summary, genetic relatedness of 129 sesame cultivars and landraces were assessed in the present study using 23 informative SSR markers. The results indicated presence of a high level of molecular genetic diversity within the selected set of germplasm. Clusters from UPGMA analysis largely matched with the population groups observed in the STRUCTURE analysis. Although no significant correlation was found to support the clustering of the genotypes based on their geographical origin, AMOVA indicated that genetic variability among the populations was higher in model-based population cluster analysis in contrast to analysis among country of origins. The STRUCTURE analysis following Evanno’s ad hoc ΔK method (Evanno et al. 2005) suggested that the 129 populations included in the study were most likely form three clusters (K = 3). The mixed clustering pattern of individuals of the cultivated and landrace populations was observed in the population structure constructed based on STRUCTURE software. Moreover, the UPGMA dendrogram, based on pair-wise simple matching similarity index among the 91 cultivated and 38 landrace populations, showed eight clusters. It was recommended that isolation from cultivars is beneficial to preserve the integrity and diversity of these landrace germplasm accessions. The fact that the germplasm populations collected worldwide grouped very closely with Korean cultivars indicates the occurrence of gene flow between them via hybridization and/or cultivars becoming naturalized as free-living populations. Further, the results in this study demonstrated that SSR markers can be highly effective for genetic diversity assessment in sesame. The crossing of germplasm accessions from different groups or with outliers is highly recommended for broadening the genetic base of current sesame cultivars. The authors are thankful to the Department of Oil Crop Research Division, Rural Development Administration (RDA), Republic of Korea. This work was supported by Agenda project (Grant No. PJ012536) of the Rural Development Administration (RDA), Republic of Korea. The authors would like to thank Dr. Lee Jeong-Dong, Kyungpook National University, for his assistance in viewing and editing our manuscript. Fig. 1. 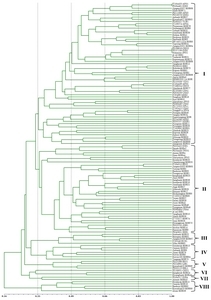 Cluster tree constructed by SHAHN method based on the allele information of 129 sesame genotypes screened using 23 SSR markers. Fig. 2. Estimated population structure of sesame accessions assessed by STRUCTURE. a) Determining the optimal value of K by two different methods. Red line: the ad hoc procedure described by . Blue line: the second-order statistics (ΔK) developed by . b) The different colors represent different groups inferred by STRUCTURE analysis: Pop1 = Red, Pop2 = Green, Pop3 = Blue. On each barcode are the genotypes with the country’s abbreviations corresponding to . Genotypes, source and origin/collection site codes of 129 sesame cultivars and landraces. I, II, III, IV, V, VI, VII, and VIII represents cluster assignments based on the UPGMA by SAHN dendrogram. Details of 23 informative SSR markers used for molecular variance and population structure analysis of 129 sesame genotypes. HW F: Hardy–Weinberg Equilibrium F Significance (***with Bonferroni correction i.e type I error; ND: not done). Population pairwise FST estimates among three populations identified. Analysis of molecular variance (AMOVA) results for populations of the model-based structure and respective country of origins. Grouping for AMOVA: Group 1 (4 landraces from Afghanistan); Group 2 (3 landraces from China); Group 3 (4 landraces from India); Group 4 (2 landraces from Iran); Group 5 (2 mutants, 1 landrace from Israel); Group 6 (1 landrace from Jordan); Group 7 (1 landrace, 4 commercial cultivars from Japan); Group 8 (4 landraces, 6 elite lines, 11 commercial and 70 modern cultivars); Group 9 (1 landrace from Libya); Group 10 (3 landraces from Mexico); Group 11 (1 landrace from Myanmar); Group 12 (1 landrace from Nepal); Group 13 (1 landrace from Russia); Group 14 (1 landrace from Serbia and Montenegro); Group 15 (1 landrace from Sri Lanka); Group 16 (1 landrace from Turkey); Group 17 (1 landrace from Taiwan); Group 18 (5 landraces from the USA); Group 19 (1 landrace from Venezuela). Ali, GM, Yasumoto, S, and Seki-Katsuta, M (2007). Assessment of genetic diversity in sesame (Sesamum indicum L.) detected by Amplified Fragment Length Polymorphism markers. Electron J Biotechnol. 10, 12-23. Anilakumar, KR, Pal, A, Khanumand, F, and Bawa, AS (2010). Nutritional, medicinal and industrial uses of sesame (Sesamum indicum L.) seeds-An overview. Agriculturae Conspectus Scientificus. 75, 159-168. Barbosa, CV, Silva, AS, de Oliveira, CV, Massa, NM, de Sousa, YR, and da Costa, WK (2017). Effects of sesame (Sesamum indicum L.) supplementation on creatine kinase, lactate dehydrogenase, oxidative stress markers, and aerobic capacity in semi-professional soccer players. Front Physiol. 8, 196. Bhat, KV, Babrekar, PP, and Lakhanpaul, S (1999). Study of genetic diversity in Indian and exotic sesame (Sesamum indicum L.) germplasm using Random Amplified Polymorphic DNA (RAPD) markers. Euphytica. 110, 21-34. Cho, YI, Park, JH, Lee, CW, Ra, WH, Chung, JW, and Lee, JR (2011). Evaluation of the genetic diversity and population structure of sesame (Sesamum indicum L.) using microsatellite markers. Genes Genomics. 33, 187-195. Cui, C, Mei, H, Liu, Y, Zhang, H, and Zheng, Y (2017). Genetic diversity, population structure, and linkage disequilibrium of an association-mapping panel revealed by genomeide SNP markers in sesame. Front Plant Sci. 8, 1189. Dixit, A, Jin, MH, Chung, JW, Yu, JW, Chung, HK, and Ma, KH (2005). Development of polymorphic microsatellite markers in sesame (Sesamum indicum L.). Mol. Ecol. Notes. 5, 736-738. Dossa, K, Wei, X, Zhang, Y, Fonceka, D, Yang, W, and Diouf, D (2016). Analysis of genetic diversity and population structure of sesame accessions from Africa and Asia as major centers of its cultivation. Genes. 7, 14. Dossa, K, Yu, J, Liao, B, Cisse, N, and Zhang, X (2017). Development of highly informative genome-wide single sequence repeat markers for breeding applications in sesame and construction of a web resource: SisatBase. Front Plant Sci. 8, 1470. Ercan, AG, Taskin, M, and Turgut, K (2004). Analysis of genetic diversity in Turkish sesame (Sesamum indicum L.) populations using RAPD markers. Genet Resour Crop Evol. 51, 599-607. Evanno, G, Regnaut, S, and Goudet, J (2005). Detecting the number of clusters of individuals using the software STRUCTURE: a simulation study. Mol Ecol. 14, 2611-2620. Excoffier, L, Laval, G, and Schneider, S (2005). ARLEQUIN (version 3.0): an integrated software package for population genetics data analysis. Evol Bioinform Online. 1, 47-50. Hanzawa, F, Nomura, S, Sakuma, E, Uchida, T, and Ikeda, S (2013). Dietary sesame seed and its lignan, sesamin, increase tocopherol and phylloquinone concentrations in male rats. J Nutr. 143, 1067-1073. Hirata, F, Fujita, K, Ishikura, Y, Hosoda, K, Ishikawa, T, and Nakamura, H (1996). Hypocholesterolemic effect of sesame lignan in humans. Atherosclerosis. 122, 135-136. Kalia, RK, Rai, MK, Kalia, S, Singh, R, and Dhawan, AK (2011). Microsatellite markers: an overview of the recent progress in plants. Euphytica. 177, 309-334. Kang, CW, Kim, SY, Lee, SW, Mathur, PN, Hodgkin, T, and Zhou, MD (2006). Selection of a core collection of Korean germplasm by a stepwise clustering method. Breed Sci. 56, 85-91. Kim, DH, Kashi, Y, Zur, G, Danin-Poleg, Y, Lee, SW, and Shim, KB (2001). Genetic relationships among sesame (Sesamum indicum) accessions using inter-simple sequence repeats (ISSR) markers. Korean J Breed Sci. 33, 257-269. Kim, DH, Zur, G, Danin-Poleg, Y, Lee, SW, Shim, KB, and Kang, CW (2002). Genetic relationships of sesame germplasm collection as revealed by inter-simple sequence repeats. Plant Breed. 121, 259-262. Lischer, HEL, and Excoffier, L (2012). PGDSpider: an automated data conversion tool for connecting population genetics and genomics programs. Bioinformatics. 28, 298-299. Liu, KJ, and Muse, SV (2005). PowerMarker: an integrated analysis environment for genetic marker analysis. Bioinformatics. 21, 2128-2129. Min, S-K, Choi, B, Park, J-H, Chung, J-W, Kim, K-W, and Park, YJ (2016). Assessment of genetic diversity and population structure of the sub core set in sesame (Sesamum indicum) using SSR markers. J Korean Soc Int Agric. 28, 73-83. Mondal, N, Bhat, KV, Srivastave, PS, and Sen, SK (2015). Effects of domestication bottleneck and selection on fatty acid desaturases in Indian sesame germplasm. Plant Genet Resour. 14, 81-90. Okello-Anyanga, W, Hasel-Hohl, K, Burg, A, Gaubitzer, S, Rubaihayo, PR, and Vollmann, J (2017). Towards the selection of superior sesame lines based on genetic and phenotypic characterisation for Uganda. J Agric Sci. 9, 13-35. Pritchard, JK, Stephens, M, and Donnelly, P (2000). Inference of population structure using multilocus genotype data. Genetics. 155, 945-959. Rao, PVR, Prasuna, K, Anuradha, G, Shividhya, A, Reddy, VLN, and Shankar, VG (2013). Molecular mapping and tagging of powdery mildew tolerance gene(s) in sesame (Sesamum indicum). Indian J Agr Sci. 83, 605-610. Rao, VR, and Hodgkin, T (2002). Genetic diversity and conservation and utilization of plant genetic resources. Plant Cell Tissue Organ Cult. 68, 1-19. Uchida, T, Ichikawa, T, Abe, C, Yamashita, K, and Ikeda, S (2007). Dietary sesame seed decreases urinary excretion of alpha- and gamma-tocopherol metabolites in rats. J Nut Sci Vitaminol. 53, 372-376. Uncu, AO, Gultekin, V, Allmer, J, Frary, A, and Doganlar, S (2015). Genomic simple sequence repeat markers reveal patterns of genetic relatedness and diversity in sesame. Plant Genome. 8, 1-12. Wang, L, Yu, S, Tong, C, Zhao, Y, Liu, Y, and Song, C (2014a). Genome sequencing of the high oil crop sesame provides insight into oil biosynthesis. BMC Genome Biol. 15, R39. Wang, L, Han, X, Zhang, Y, Li, D, Wei, X, and Ding, X (2014b). Deep resequencing reveals allelic variation in Sesamum indicum. BMC Plant Biol. 14, 225. Wang, L, Zhang, Y, Zhu, X, Zhu, X, Li, D, and Zhang, X (2017). Development of an SSR-based genetic map in sesame and identification of quantitative trait loci associated with charcoal rot resistance. Sci Rep. 7, 8349. Wei, W, Zhang, Y, Lü, H, Li, D, Wang, L, and Zhang, X (2013). Association analysis for quality traits in a diverse panel of Chinese sesame (Sesamum indicum L.) germplasm. J Integr Plant Biol. 55, 745-758. Wei, X, Wang, L, Zhang, Y, Qi, X, Wang, X, and Ding, X (2014). Development of simple sequence repeat (SSR) markers of sesame (Sesamum indicum) from a genome survey. Molecules. 19, 5150-5162. Wei, X, Zhu, X, Yu, J, Wang, L, Zhang, Y, and Li, D (2016). Identification of sesame genomic variations from genome comparison of landrace and variety. Front Plant Sci. 7, 1169. Zhang, H, Wei, L, Miao, H, Zhang, T, and Wang, C (2012). Development and validation of genic-SSR markers in sesame by RNA-seq. BMC Genomics. 13, 316. Zhang, H, Miao, H, Wang, L, Qu, L, Liu, H, and Wang, Q (2013). 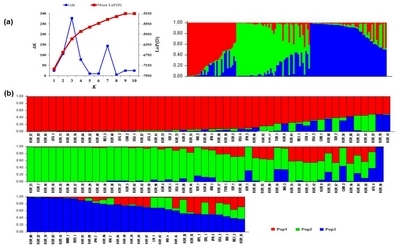 Genome sequencing of the important oilseed crop Sesamum indicum L. Genome Biol. 14, 401.